Every homeowner who built a house with his own hands faced a flooring problem. Many have yet to meet with this issue. How to lay a wooden floor in the house, what to look for when doing this work? You should answer these questions in more detail. The modern construction market in its range has a large amount of materials for floor equipment. 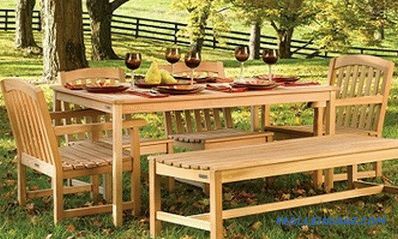 They are synthetic and natural, including natural wood. Modern developers for the most part to wooden floors do not show much interest. But just such a floor can look great in any interior, if it is properly laid and properly cared for. For dozens of years he can rejoice his view with his natural appeal. But beauty should be in close cooperation with comfort and ease of use. No one will like the unpleasant squeak that floorboards can make. 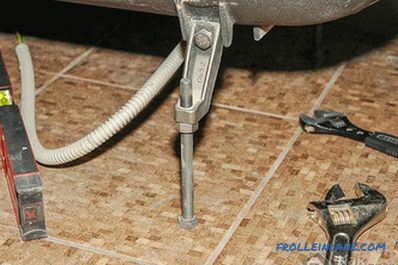 This happens in the case when the flooring of the wooden floor is made without compliance with the technology, with errors. If you lay the floor with your own hands in compliance with the rules, it will turn out to be warm and almost noiseless. After several decades, separate damaged areas of the floor are quite easy to replace with new ones. 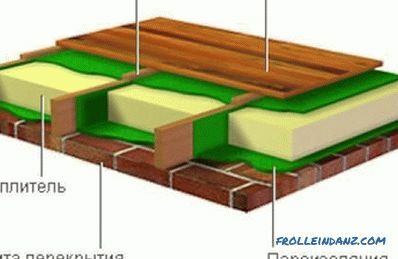 three-layer laminated parquet board: the top layer is a valuable wood species layers made of pine. For greater durability of wooden floors, the material for their arrangement should be chosen carefully. It is preferable to use softwood boards. Durable and wear-resistant floors are obtained from cedar and larch, fir, spruce and pine. Oak and beech are used for hardwood. Boards are recommended to buy with a small margin. The material must be dry, otherwise the floor will be deformed. It is better not to save on the purchase of boards. At the choice it is necessary to reject material with resin spots, with cracks. Well, if the boards do not require further grinding. Wood of light shades, having a beautiful natural pattern, does not need a floor covering. 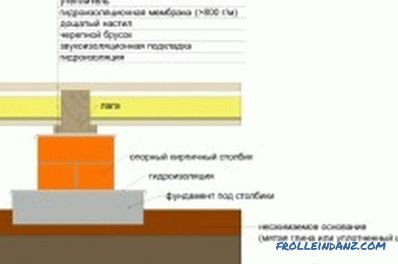 Scheme of floor insulation on logs. 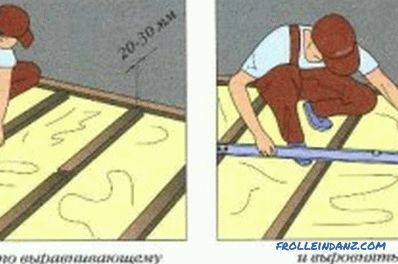 It is better to lay the wooden floor with your own hands in the spring when the heating season is over. Flooring in summer and winter can cause wood to crack. All material must be treated with a flame retardant composition. 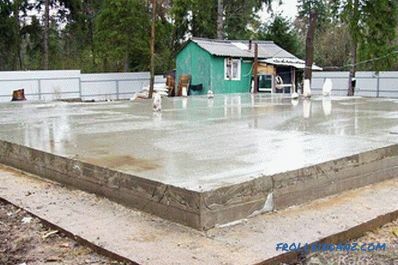 This will save the floor from rotting and make it resistant to fires. It is recommended to saturate the underside of the boards with antiseptics, which are good to use sodium fluoride and ammonium fluorosilicate. Laying on logs is the most common way to decorate a wooden floor with your own hands. This method is convenient in that logs can be laid on any base: on the ground, on a wooden or concrete base, on the floor beams. The main advantage of such a floor is the ability to hide various communications under it. 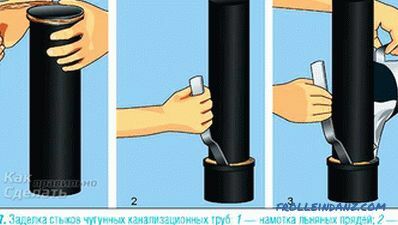 But there is a significant drawback to this method: it is not suitable for use in rooms with low ceilings. The device of the plank black floor in the traditional way. 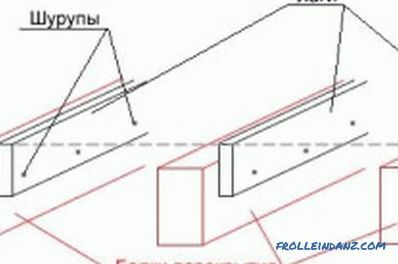 Lags are wooden beams or bars, thick planks put on an edge. Before laying, they must be kept indoors for several days for acclimatization and treated with a water-repellent compound. Lags are installed on a layer of waterproofing material, which is used as a penofol or ordinary polyethylene film. Rolled materials are laid on the base with an overlap, the size of which is about 20 cm. Joints can be additionally glued with scotch tape. with a thickness of more 40 mm - 1 m.
Lags with a section of 50x80 or 50x100 mm are located on the base, covered with a waterproofing layer, perpendicular to the rays of light falling from the window. Horizontal stacking is controlled by the level of any type. 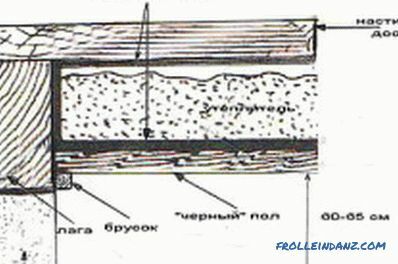 The height of the log is regulated with the help of wooden wedges that are enclosed under the logs. Fastening to the base produced dowels, at least - glue. They can be nailed to a wooden base or fastened with screws. First, the lags are laid to the opposite walls of the room. They are carefully leveled to the level and stretch between them a fishing line or a strong thread.It will serve as a guide when laying the following logs. In the interval between the lags place different pipes, wires in the corrugations and other communications. The rest of the space is used for laying heat and sound insulating material, which is used as mineral wool, foam, expanded clay and other insulation. Floor made from tongue-and-groove boards. 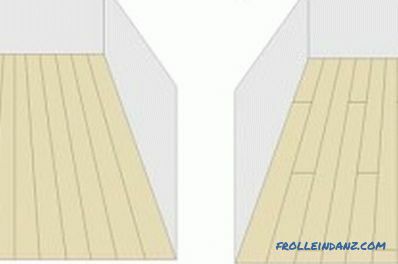 Lags are set, you can begin the installation of wooden floors. Boards are laid parallel to the light rays from the window. 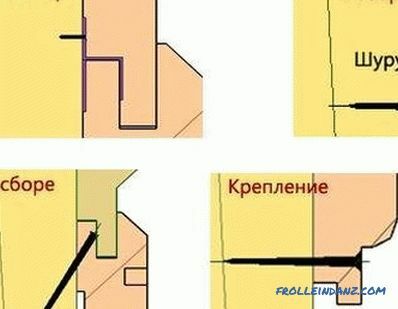 If their length is insufficient, they should be cut so that the joints fall in the middle of the lag. Begin laying from the wall, leaving a seam 1.5-2 cm wide in case of thermal expansion of the flooring. To fix the boards you need nails, and better with screws for each lag. The length of the nail should be three times the thickness of the board. The board is placed on the logs with a spike against the wall. 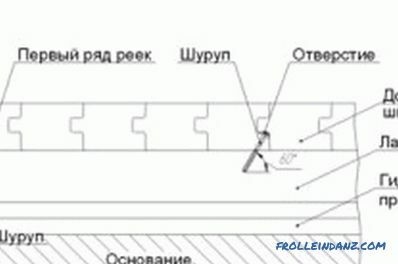 The nails are driven into the lower edge of the groove at an angle of approximately 45 degrees and the head is sunk using a special doboin box. So they will be completely invisible. The following boards are laid with their spikes in the grooves of the previous boards. If necessary, they are compacted with a hammer blow, using an intermediate wooden strip, so as not to damage the edge of the board. If the boards are fastened with screws, it is recommended for them to drill holes with a thin drill so that the board does not split. Ends work by installing baseboards. It is advisable to use wood products. 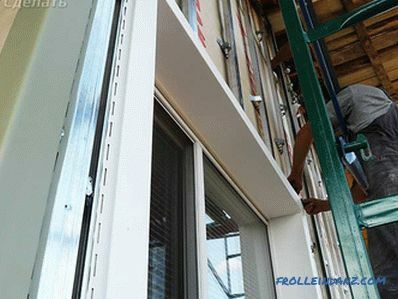 They need to be fixed only to the wall, so that they will not warp when the floor is thermally expanded. In the corners, the ends of the plinths are filmed at a 45-degree angle using a miter box or other tools. Technology for laying wooden floors. Laying a wooden floor with your own hands is a rather laborious work that takes a whole day. In order not to damage the knees, it is recommended to use knee pads. The floor is laid after all plastering and painting has been completed. Otherwise, spots will appear on the surface of the new floor, which can be quite difficult to get rid of. If necessary, the surface of the wooden floor is polished. It is better to use a special grinding machine for this job. To increase its durability, the finished floor is coated with varnish or paint of any color in several layers. Before applying the surface of the new floor must be treated with a primer. If desired, a new laminate, linoleum, carpet and other materials can be laid on the wooden floor at any time. To increase the strength of the floor, you can install cross-pieces between 1.5-2 m between the lags. Nails must be made of copper or brass. They will never allow rust or dark spots on the floor surface. Before you lay the wooden floor with your own hands, you need to select and purchase quality material. 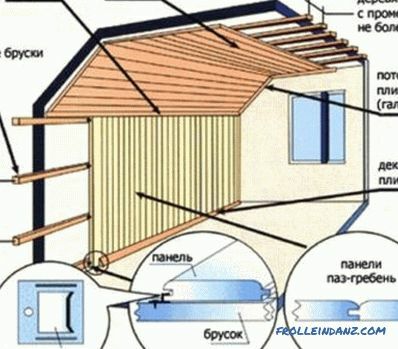 It is better to choose treated cone boards of coniferous wood. For lag need even and dry bars. From tools it is enough to have a hacksaw, tape measure, hammer, screwdriver. If you follow the rules and put your soul into the work, the result will be excellent. How to properly fasten the eurolining?